SoldierStrong was happy to partner with Dinosaur Bar-B-Que for a limited-time charity offering called ‘Sauce for a Cause.’ Beginning Friday, May 27th and running through June, all proceeds from purchases of the co-branded Sensuous Slathering BBQ Sauce went to SoldierStrong, which the organization will use towards the purchase of cutting-edge medical technologies to benefit injured veterans. The Sensuous Slathering BBQ Sauce sold for $5.95 and will be available for purchase in all 10 Dinosaur Bar-B-Que store locations as well as online Dino Store and SoldierStrong’s website. After years of cooking on the road for motorcycle shows, fairs, and festivals up and down the East Coast, Pit Master John Stage founded Dinosaur Bar-B-Que in Syracuse, New York in 1988. The restaurant quickly gained a reputation far and wide for serving some of the best BBQ in the country, along with a vibrant and lively atmosphere. 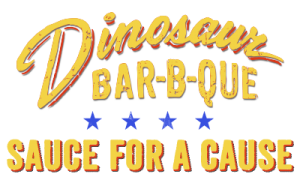 Today, Dinosaur Bar-B-Que continues to be a recognized leader in the world of barbecue restaurants with a brand that currently includes ten locations (Rochester, NY – 1994; Harlem, NY – 2004; Troy, NY – 2010; Newark, NJ – 2012; Stamford, CT – 2012; Brooklyn, NY – 2013; Buffalo, NY – 2014; Chicago, IL – 2015; Baltimore, MD – 2015). For more information about Dinosaur Bar-B-Que, please visit www.dinosaurbarbque.com.